I have a gap below my galley drawers, in both Interstates, and not being clever nor handy so as to make new drawers to fill this space I use it for parchment paper, cling wrap, foil, etc. A nice, after market side business could be made by some of you, serving with modifications those of us who are not so clever. 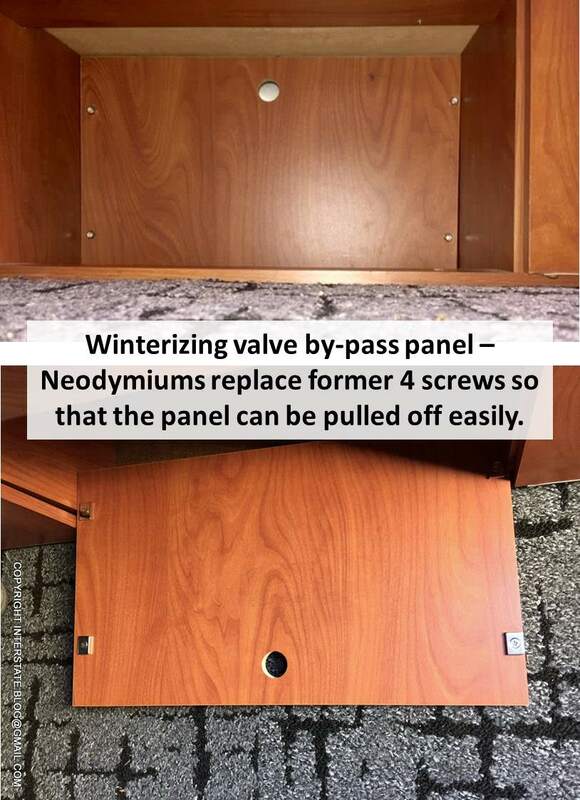 Certain T1N Interstates have a semi-permanently-screwed-on cabinetry panel covering the hot water heater's isolation valves. Many a newbie has concluded erroneously that this panel was never intended to be removed (such confusion usually manifests as a declaration of "hot water heater not working" because the valves are in the wrong position). Typically this space is accessed for winterizing, but I find I also need to vacuum dog hair, dirt, and goose down out of that area. Plus certain small items that accidentally fall down behind the couch can only be retrieved by removing that panel. It is not a fun job to lay down on that floor and un-do those four screws, then do them back up again in that awkward little recessed area. It typically takes four times the energy as the task for which they needed to be removed in the first place. So, now the panel attaches via neodyms instead. To remove, just yank at the finger pull hole. This panel fronts on a small but valuable recessed space that I intend to re-purpose, hence the completion of this first ergonomic step. After I removed those screws (T1N) I was planning on using Dzus fasteners or the like. But since I didn’t have any handy- I just pushed it back and and it was darn tight like it was. It is still like that- no screws at all. But it bugs me and I should really do something. I used velcro to secure that panel. I also captured enough space in there to store my unused, but required to carry, snow chains. INTERBLOG - Great idea. Even in the NCV3, there's couple of panels that I know could use this mod and still be secure even when driving. I thought about it, but I'm avoiding organic materials and especially adhesives wherever possible. I applied Velcro dots to secure Reflectix sheets to the inside surfaces of the windows, and it's all a smeared mess by this time. The heat, again. It just destroys everything. Now I have to de-goo that stuff and start over. I suppose perhaps I could have stapled the Velcro to the two wooden surfaces, but I kinda wanted to re-use the same screw holes. 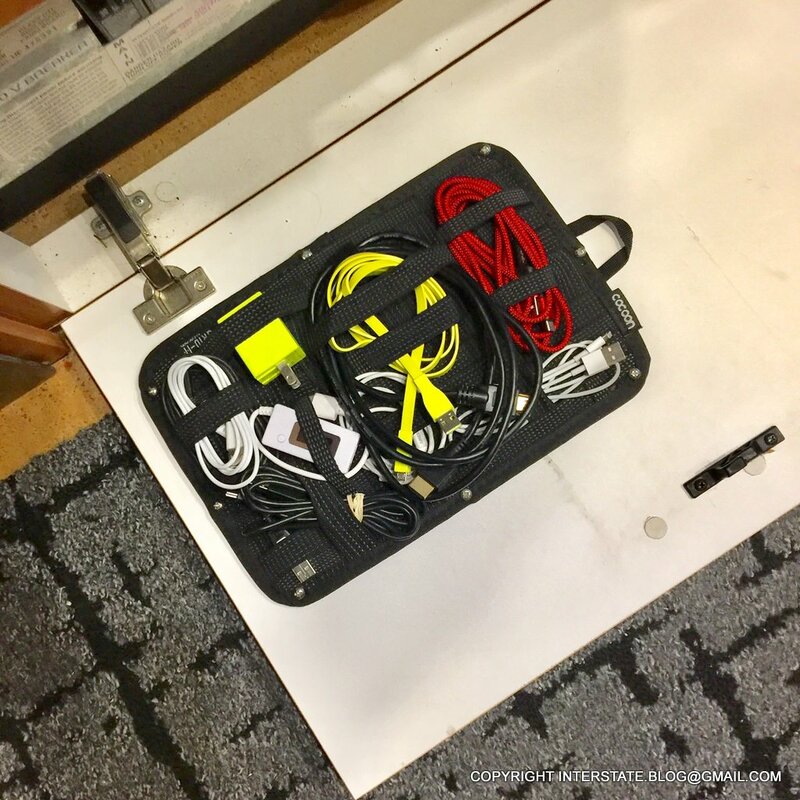 A Grid-It cord organizer screwed to the inside of one of the flip-down cabinet faces. A bit inconvenient being near the floor, but I didn't want to waste more valuable real estate on it. I'm sick of cords cluttering up the place. As well as having multiple needs for the the "old" USB cables, we now have to carry USB Type-C. And iPhone cords, and HDMI, and my Powerpoint projector is so old that it only takes VGA, which requires an adapter because my computer only takes HDMI. Don't even get me started on the more elaborate device charging apparatus. Sanity hint: Buy each type of cord in a different color. White for iPhones only; white USB cords are banned from our house. Black for older USB unless you have an application where high visibility is needed. I chose red as the color of my new USB-C cords. I'm gradually consuming the back side of every cabinet face for organizational stuff like this. Here's my mod after 4 days with Lew at AM solar, 4 solar panels, weBoost with antenna at the rear, victron amazing blue power center with bluetooth apps, lithium battery, interior propane switch. I can reach control panel from driver's seat. I told him I needed to retain space in back for litter box since I travel with a cat and everything fit perfectly. The space now occupied by the battery and inverter was where the cat sometimes slept, but he has plenty of other places to sleep. And, now I can sleep while travelling without worrying about the lousy batteries. Lew does amazing work. Nice!. Let us know how it performs. Is that a single battery and what is the AH rating? Sanity hint: Buy each type of cord in a different color. Nice idea. I can do this on the back of the drop down panel over my fuse box, between the twin beds. There is plenty of clearance there. I have gone with purple for the USB C cords. Much better than having to check the ends to find the right cord. USB C is the best idea ever; no more checking for right side up. IB that Grid It organizer is going on my next to buy list. You are so right with technology these days the amount of cords and plugs and wires, it can get a little overwhelming. We use our label maker to label them as we are also using two generations of phones right now also.